Dutch lawmaker Geert Wilders was placed under 24-hour guard after releasing a film Muslims viewed as critical of Islam . . .
And 12 cartoons depicting the prophet Mohammed were published in a Danish newspaper, triggering massive protests in Muslim countries. Now Dutch prosecutors have turned the tables and said they would charge an Arab cultural group under hate speech laws for publishing a cartoon suggesting that the Holocaust, in which 6 million Jews were exterminated, is a fabrication. The cartoon appeared on the Web site of the Dutch arm of the Arab European League. 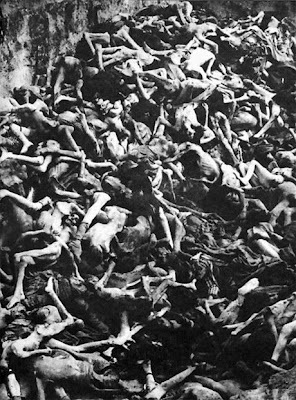 It shows two presumably Jewish men standing near a pile of skeletons with a sign that says "Auswitch" — an obvious reference to the Nazi death camp at Auschwitz. One man pokes a bone with a stick and says, "I don't think they're Jews." The other man replies, "We have to get to the 6 million somehow." The public prosecutor's office in the Dutch city Utrecht said the cartoon insults Jews as a group and is therefore an illegal form of discrimination, the Jerusalem Post reported. Prosecutors plan to press charges for "insulting a group and distributing an insulting image," which could lead to a jail sentence or fine. The Arab group said it doesn't deny the reality of the Holocaust, but published the cartoon to highlight a double standard regarding the publication of offensive material by Muslims and non-Muslims. Interestingly, Arab European League Chairman Abdoulmouthalib Bouzerda said anyone should be permitted to publish insulting material in the interest of public debate.